I have for a long time - some years - considered buying an electric bicycle in stead of my car. I have waited for a dynamo so that when you bicycle your battery is loaded. Then saturday april 30th I bought an electrical bicycle..
And when my car has been repaired my nephew will get it. He has just gotten his first child so they need a car I thought. I live on the countryside where trains or buses don´t run that much so it is a big decision. I bought a quite solid bicycle as I have to bring some equipment every monday in the winter season. 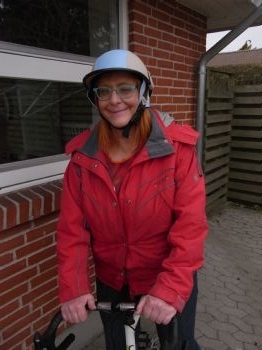 Next monday is the last day for that so I can use my summer to get used to go by bicycle in any kind of weather - When I use less motor power I can go longer without loading the battery. I did not get a car before I became 44 years old but at that time I lived in the Copenhagen area so public transportation was in a civilised condition - That is often, near and every 10th or 20min. Here it is comparably primitive but much better than in US where you guys are totally helpless without cars outside any town. Now I have had my electric bicycle for some time - and no car. I must say... I get more exercise than for years!! And I am happier and have more energy and my weight has begun going down. So I have decided to give myself 10 kr for every pound. That is about 2 dollars. I put them in my saving box for non-food pleasures and options. I love my bike. I wish I could give up my car and only ride my bike!